The Texas A&M women haven’t lost a dual meet all season so far (they topped Missouri, Vanderbilt, and Texas), and were also the victors at their hosted Art Adamson Invitational. 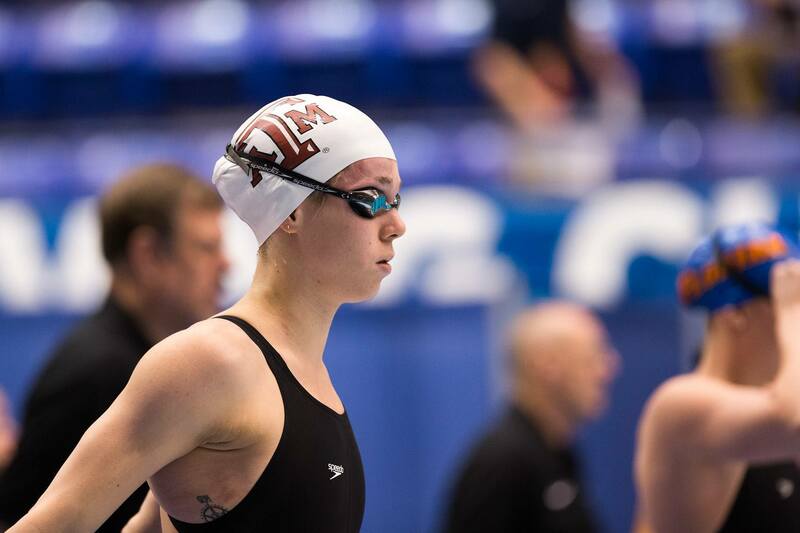 Even without three of their stars, Cammile Adams, Sarah Henry, and Breeja Larson, who were competing at the Duel in the Pool, or Lili Ibanez, A&M was able to hold off a much-improved Rice team at home on Friday afternoon. Colleen Konetzke won the first individual event of the day, the 1000 free, with a 10:09.21 to top Rice’s Erin Flanigan (10:13.03). The Aggies would then steamroll to sweeps of the next three events, including a 53.90 from senior All-American Paige Miller in the 100 yard back, which was the best swim of the day. She also won the 100 fly later in 54.37. The best battle of the day came in the 200 fly, where Caroline McElhany of A&M and Casey Clark of Rice fought hard through 150 yards before McElhany pulled away at the end to win. She was a 1:59.44, with Clark taking 2nd in 2:01.28. That is the first time this season that McElhany has swum this race, as she didn’t make her debut until a few light races at the Adamson Invitational last week. Meanwhile, Clark teeters on the verge of NCAA qualifying in this event, and if she rests for the Owls’ conference championship meet in the way she normally does, she should be on her way to Minneapolis. Clark was the closest the Owls had to an individual event win on the day; in addition to that 200 fly, she also swam a 54.49 in the 100 fly, which she lost to Miller by just a tenth-of-a-second. The aforementioned McMahon won three individual events on the day. The Irish import was a 1:02.6 in the 100 breaststroke, a 4:56.8 in the 500 free, and a 2:02.94 in the 200 IM. Her teammate, Canadian Ashley McGregor, won the 200 breaststroke in 2:15.03. Also racking up multiple wins for the Aggies was Sammie Bosma, who is a part of a revitalized A&M sprint group. She won the 50 free in 23.08, and then took the 100 free in 50.03. A&M would end up splitting their 400 free relays at the end of the meet, dividing their 12 best freestylers among their top three relays. This resulted in some great racing, and despite the come-from-behind efforts of Meredith Oliver (50.03 split to Anchor the Aggies’ B-relay), Rice won the relay in 3:29.26. That included a 51.1 lead-off from Clarke, who was joined by Cora McKenzie (52.18), Chelsea Fong (53.51), and Kimberly Steinhouse (52.26). Texas A&M’s next meet will be a hosted affair against the defending NCAA Champion Georgia Bulldogs on January 10th, and Rice is off until January 25th when they travel to Fayetteville, Arkansas for another tough SEC dual against the Arkansas Razorbacks.